Orlando, Florida has become the tourism capital of the world and Sea World is one of its most visited attractions. The beautiful Renaissance Orlando at Sea World is just steps away from Sea World, has a fantastic free water park for kids, a luxurious spa, half a dozen on-site restaurants, a stunning ocean-themed interior courtyard and exclusive benefits vacation packages for SeaWorld Orlando and Aquatica! Ana Murillo, Sales Coordinator at Renaissance Orlando at Sea World, explained their guest-friendly focus, "Every guest is greeted with a glass of champagne or cider to start your stay the right way! We decided not to nickel and dime guests as other resorts do. We have eliminated resort fees. We offer a complimentary gym. We built a complimentary water park for children. We have an on-site laundromat with washers and dryers where guests can wash their own clothes for a small charge per load. We offer a shuttle service to Disney for only $2. Taxis charge $60 for the same ride! We have partnered with Sea World and offer complimentary shuttles and Quick Queue! 300 guests every day can get their Quick Queue pass at our Concierge Desk that enables them to go to the front of the line at several Sea World attractions." To book this package, call 1-800-380-7917 and ask for promo code THM. The nèu lotus spa is named for the petals of a lotus flower. The 5,500 square foot nèu lotus spa features eight treatment rooms, a private locker room with steam room, a relaxation area and nail salon. Guests can indulge themselves with treatments like the micronized marine algae re-mineralizing envelopment or the purely pomegranate sugar glow and massage. The spa is open from 9:00 a.m. to 7:00 p.m. daily (subject to change). Visit www.neulotusspa.com for more information. The Renaissance Orlando at Sea World has 716 oversized guestrooms that feature 32-inch flat panel TVs, high-speed internet access, luxurious bedding and large marble bathrooms complete with a Shamu squirt toy in the bathtub! The hotel has 65 suites for guests desiring additional space with sitting and dining areas. We found our room to be quite spacious, well designed and comfortable with an excellent view of Sea World from our balcony. The on-site restaurants are a huge asset for guests and include Mist Sushi and Spirits, Tradewinds Restaurant, Boardwalk Sports Bar, Palms Pool Bar & Grill, Starbucks, and a brand new ice cream parlor. Our buffet breakfast at Tradewinds Restaurant was one of the best we have experienced anywhere. 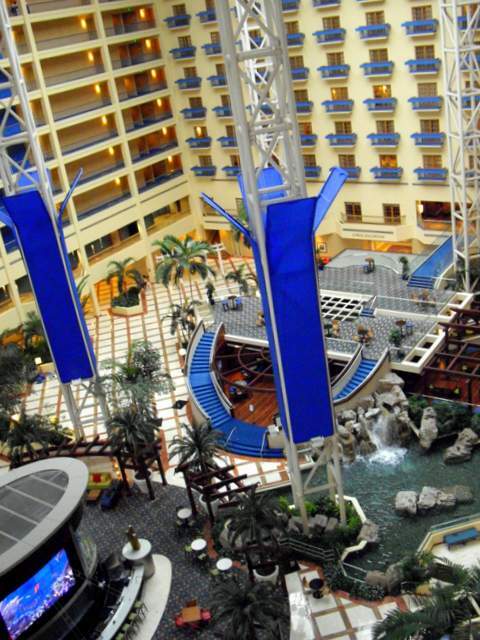 We highly recommend the Renaissance Orlando at Sea World. The ocean-themed decor is beautiful. The service is top notch. The pool and waterpark are great for families with children. The on-site restaurants are convenient. The special vacation packages offer guests excellent benefits and the "we don't try to nickel and dime you to death" policy is a refreshing change.